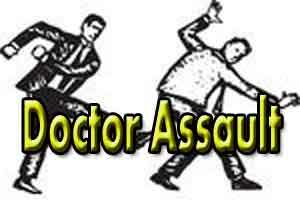 Chandigarh: Medical professionals are often roughed up on the allegations of medical negligence, but recently, a doctor became a victim of assault due to an attendance dispute with a nurse. According to media reports, Dr Abhimanyu, Medical Officer In-charge at the Community Health Centre (CHC) in Dadri city was allegedly assaulted by the husband of a staff nurse, who earlier had an argument with the doctor over her attendance. TOI reports that the incident occurred at around 8 am when the nurse, who was on deputation, asked the doctor to mark her attendance. Expressing inability, Dr Abhimanyu asked her to provide the official orders about her posting. This led to an argument between the two. Alleging harassment, the nurse called her husband, who later came to the health center with his friends and assaulted the doctor. Soon after the incident, senior doctors rushed to the spot. Both the parties have lodged police complaints. While, Dr Abhimanyu has registered a complaint alleging assault, trespass, causing obstruction in the discharge of the official duty of government servant, at Dadri police station, the nurse has lodged a complaint with the women police station while accusing the doctor of behaving indecently for 3 days and threatening her. According to a recent report by Dainik Bhaskar, the staff nurse also alleged that the doctor, in a bid to humiliate her, withheld all the responsibilities assigned to her and more so, kept the record register to himself and took away all the other charges as well. However, Dadri SHO Gaurav Sharma said that contents of the complaint are being verified and adequate action will follow. “We don’t know as to where the woman had lodged the complaint. We have registered the case after recording the statements of staff members as well. The nurse had also threatened to lodge a complaint. She might have lodged before the Women police station,” the SHO informed TOI. SC and ST act, Dowry act and sexual harrasment act at are weapon to take advantage. The case must be genuinely investigated by Police & Culprit must be Punished as per New law. Drs.must be protected by Police on top priority.